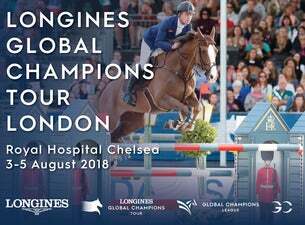 Returning to the Royal Hospital Chelsea, Longines Global Champions Tour and GCL of London brings the world’s top show jumpers together for an unmissable sporting and social event for the whole family. Known as the Formula 1 of equestrian sport, Longines Global Champions Tour sees the world's top ranked riders compete in unique locations around the world – including Miami Beach, Paris, Shanghai, Monaco, Berlin and Doha; while the GCL ranking battle promises to be the fiercest spectacle you’ll see this summer. Now you can enjoy edge-of-your-seat action against the stunning backdrop of the iconic Royal Hospital Chelsea as the likes of British riders Ben Maher and Emily Moffitt fight for valuable points in this thrilling sporting event. Plus, with a shopping village, refreshment areas, plenty of entertainment and an action-packed three days of sports, there’s sure to be something for all the family this August.